NARRATOR: Freddie, being an early adopter, soon borrows a device from one of the cats and begins texting away. In comes an extremely friendly message from someone he doesn’t know. In fact, she calls herself Extremely Friendly Frieda. 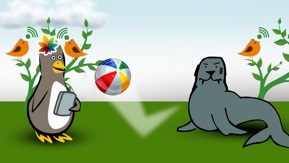 Over on Friend Island, Frieda is texting while bouncing a beach ball back and forth with a rather nasty looking seal named Sammy. There are birds tweeting in the trees. It is a very lovely place. FRIEDA: My parents told me to stay away from seals. But here on Friend Island, I can’t say no to anyone. And besides, it’s just my nature to be extremely friendly to all. I’m extremely friendly to all.